Blair Mathis, the editor from LaptopLogic.com, has prepared this review for DV Hardware. Visit LaptopLogic.com to read the latest laptop reviews and to check out Asus laptop computers. Netbooks have taken the digital world by storm, with the leader of the pack being none other than Asus. 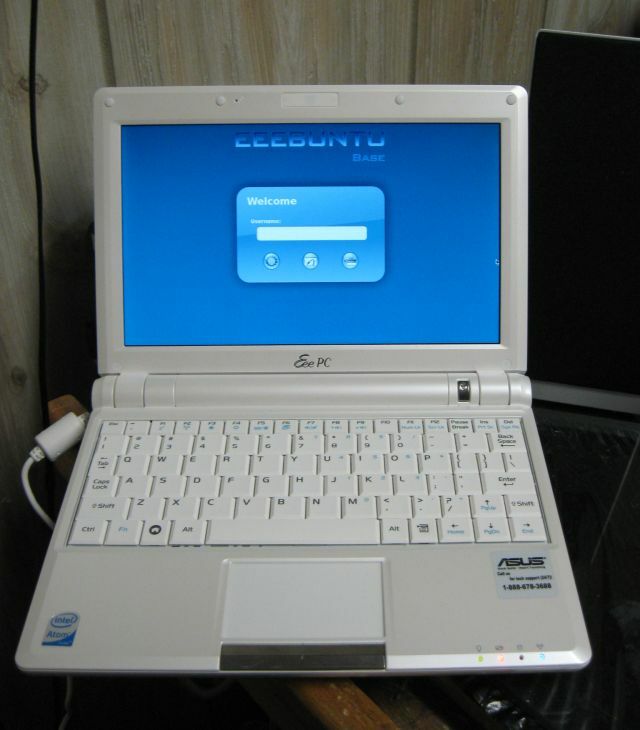 The first netbook to enter the foray was the Asus Eee PC 701, followed by a barrage of other models and makers. Acer, HP, Dell, and MSI are just a few of the dozens of computer manufacturers to release a netbook. Sales of these systems are booming as people are looking for a smaller alternative to traditional laptops. The Eee PC 900A is the cheapest model sporting an 8.9" display, I picked it up at Best Buy last month for only $199. It comes with an Intel Atom N270 1.6GHz processor, 1GB of RAM, and a 4GB SSD, and is preloaded with Asus's special Xandros Linux operating system. There are other models available though, with more storage capacity and Windows XP. 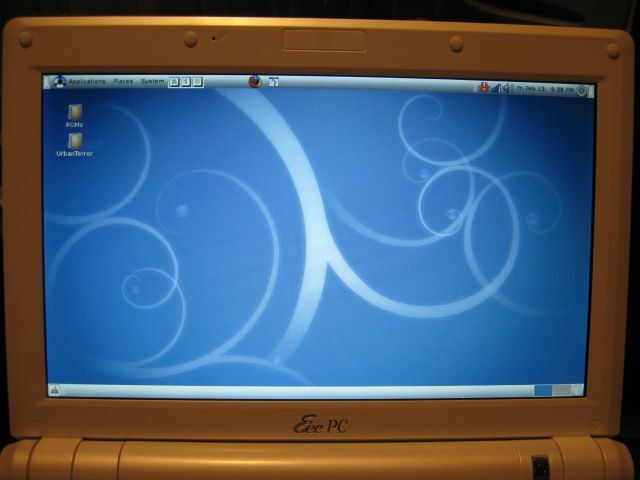 Upon first appearance, this netbook is light, sleek, and inviting. It is white with faint striations in the lid, and the screen takes up most of the lid. The keyboard has a distinct click and is small yet still large enough to type on. The right side of the body features the VGA port, two USB ports, and the SD/MMC slot. The left side has an Ethernet, one USB port, and the headphone/microphone ports. The back is large enough only for the battery, which weights nearly as much as the actual netbook, and the front is devoid of any ports or slots. 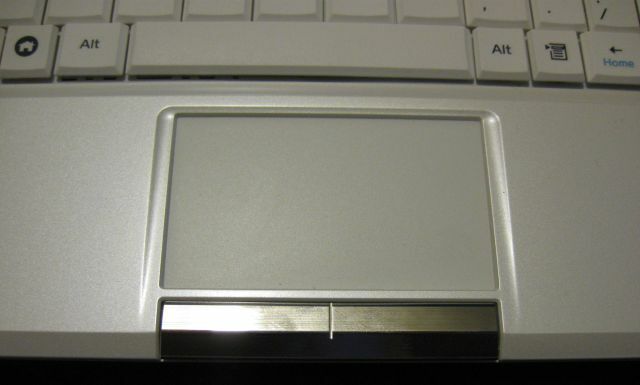 The trackpad on the 900A is responsive and easy to use. Clicking is done by either the button directly under the trackpad, which has a good response, or by double-tapping the trackpad. The lid can only open approx. 175-degrees because the battery is in the way. The default preinstalled Easy Mode Xandros operating system is indeed easy for anyone to use, including those who've never used Linux. However, it becomes tiring very quickly, as nothing can be installed. There are instructions for switching the desktop to Advanced Mode, which gives you an actual taskbar and desktop. However, what it does not tell you is that there are no universal repositories for this version of Xandros, so you can't install anything. Disappointed in the default OS, I downloaded Eeebuntu and installed it on the system. Eeebuntu is a version of Ubuntu designed to work out of the box with the Atom processor and Eee wifi/webcam. It was simple to install using an SD card in the SD slot. With Eeebuntu installed, the system is completely usable. I proceeding to install Abiword, VLC, gFTP, Pidgin, Thunderbird, ZSNES, and Urban Terror. Each application is snappy and starts quickly. The Super Nintendo Emulator works perfectly and at full speed. Urban Terror works just as well and without any hiccups--I lowered the resolution to 640x480 at fullscreen, dropped the texture and other settings to their lowest point, and restarted the game. Surprisingly, it runs without lag and is quite enjoyable. I've experienced no overheating on this system, even after playing Urban Terror for a few hours. The fan did kick on a little louder, but could hardly be heard over the sound of the game play. The bottom was warm to the touch, but not hot. 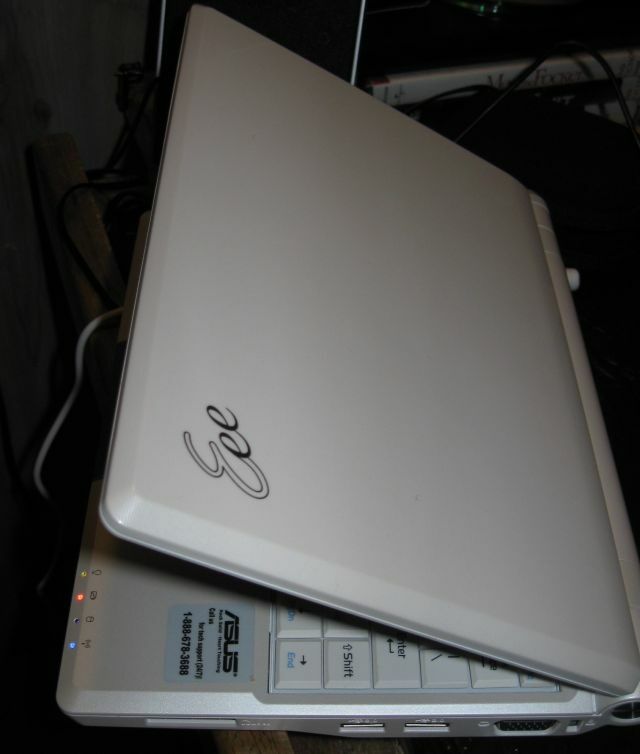 If you want to get your hands on a small notebook for the cheapest price possible and are comfortable installing a different OS onto the system, then you can't do better than the Asus Eee PC 900A. In terms of price the Eee PC 900A deserves a score of 9/10, but in terms of productivity I can only give it a 5/10. Overall I give this netbook a rating of 6/10. I got mine refurbished at $170. At this price point it is barely more expensive than a portable DVD player, but with much better features. First, there isn't a movie I can't scale and/or rip to a USB stick or SD card to play. Second, I can play music. Third, I can edit photos in The GIMP. Really, if you look at what this is intended for and buy it only if it works for you, you will find that it's an excellent product. I like mine a lot, and I would buy one again. Take out the 4GB SSD and pop in a 64GB SSD and you now have a full mobile computer that won't kill your data with a hard bump. I also put 2GB ram and this thing does just about everything I want it to do. I then added a 7800 mAh battery and it is good for 5.5 hrs unplugged. Sure I could have bought another netbook for that price with the capacity but I would be going with an SSD on whatever netbook I buy so it would have costed me more in the long run. I just don't trust spinning mechanical drives on a mobile device. Besides, the SSD uses less power. This thing is great! One problem people have with netbooks: they expect them to be like full power laptops. Seeing opinions of others about the 900a over the web proves that. For less than $200 you have small, ultra mobile pc with a simple OS designed for what netbooks are about: surfing the web, listen music, reading, do paperwork, etc. for short times. One user argues about battery time...lol at that. This asus is just good for its price sans the OS, and I agree that the best mod you can do to it is formatting the ssd and install another linux lightweight distro designed for netbooks. With so little resources why waste them installing windows? Someone forgot linux and most of its apps are free? If you are "annoyed" by battery life, the linux os or the size then spend a lot more on other netbook or laptop. 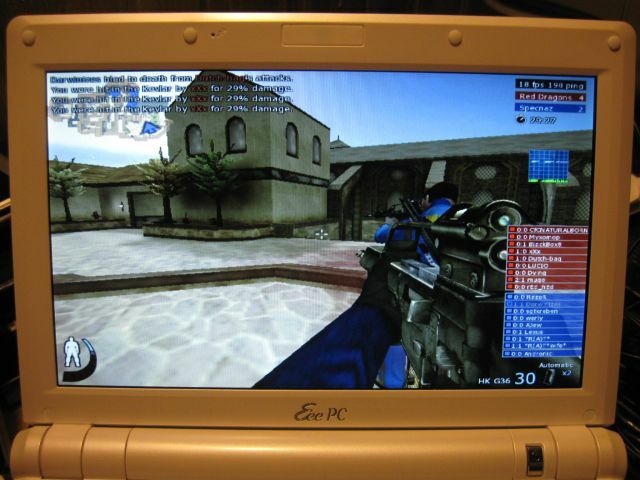 I have a Eee 900A with XP installed!. If you need a compact portable PC just for surfing & basic apps!, then this is for YOU!. POWER - No problem the battery is rated at 5 hours, but I often run it with a USB Internet Mobile access, so I get about three hours!. Also I went to my local electronic outlet and for $40 USD got a small power inverter for the car! So I just hook it up in the car & have NO Battery Problems! It is also very light and compact to carry! The Asus 900 has no auto/car plug and no way to recharge the battery while on the road. The problem with most reviewers is that they work 8 to 5 and go home at night, so they have no concept of the real, real world. How is that this one item is never mentioned on any reviews that I have read. I have to find out myself the hard way. Some light headed reviewers even go so far as to say "that the battery last so long that you don't have to 'lug' around a power adapter". After a few hrs on the airplane while everyone else is plugged in to the seat plugs this machine goes flat. End of movie, end of game, etc. What a gyp. I think this product is great for 199 dollars running Ubuntu. Good battery life, picks up wireless easily, no problems with any drivers, OpenOffice 3 is better than Word. Internet radio works great through the headphone socket. Who cares about the only 4GB SSD hard drive when you can leave in a 16GB SD card now for about 20 dollars and probably higher capacity for the same price in a few months. Also, who needs a hard drive when you can also easily plug in a 32 GB USB memory stick. The first product I see that shows me computers are going the same way as calculators did when I was young, i.e. buy one then for 200 dollars, buy one now for 5 dolllars. I notice my local BestBuy now only has the more expensive 270 dollar models runnning Windows-what a waste!